Steve Ramsey’s mobile table saw cart. I’m going to make some sort of scheme to anchor this to the workbench so they move around as one unit. Shawn Stone’s router fence. Instead of the dust collection going down into the router lift, I’m going to have a hose out the back. Because I’m thinking about using a Kreg plate, I won’t want to put a large hole in my worktop. 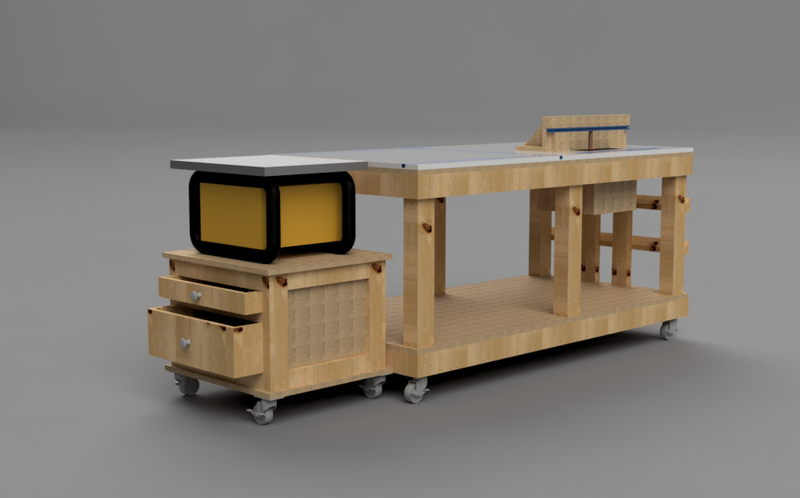 There isn’t enough room for a Dust Deputy under the workbench, so I’m still thinking of my plan to make a dust cart. The workbench is going to use some sort of shore line power system (20A twist lock is overkill, right? ), and I’m going to use that for dust collection as well. One of the reasons for not integrating the table saw into the main workbench is a size constraint. Someday we’ll be moving out of this house, so a 3 foot by 6 foot by 5 inch workbench will be manageable to get out of the basement. Its a snow day weekend, so I’m going to prep the basement for construction.